Cadence Bass Notes - What Are the Rules? The position of the Cadence Bass Notes can be a bit confusing. Should the Cadence Bass Notes ascend or descend? How far away can the Cadence Bass Notes be from the Tenor notes? What are the rules? UMTC Teacher LiPing Hudson wrote: "Please bare with me. I was puzzled with the placement of the Bass note of cadences as I studied Lesson 7 of the Advanced Rudiments Workbook (Pages 75-82) this afternoon. For IV-V or iv-V Imperfect Cadences, the Bass Notes ASCEND and the Treble Clef Notes DESCEND. For IV-I or iv-i Plagal Cadences, the Bass Note may move up a Perfect 5 or down a Perfect 4 to the Tonic. How do you know whether to go up or go down? Are there any rules for the Bass Notes for I-V or i-V, V-I or V-i Cadences? In many cases, we have a choice between the notes that are one octave apart from the lower Treble note, or notes that are even lower. Do we choose the higher or the lower note? Do we avoid using ledger line notes? What are the rules!? Thank you Shelagh!!" There are two ways of writing a cadence - Keyboard Style and Chorale Style. In Keyboard Style, the Soprano, Alto and Tenor "voices" are written as a Triad in the Treble Clef. The Bass voice is written in the Bass Clef. In Chorale Style, the Soprano is the upper voice in the Treble Staff; the Alto is the lower voice in the Treble Staff; the Tenor is the upper voice in the Bass Staff; and the Bass is the lower voice in the Bass Staff. In this Blog, I will explore and explain the Keyboard Style Cadence Rules and the rules of writing the Cadence Bass Notes in Keyboard Style. If you do not do this - if you keep both Treble Triads in the same position/inversion - then you end up with "Parallel Octaves" (and/or Parallel Perfect Fifths). These are what I call "Harmony No-Nos". To "KISS" (Keep it Super Simple), I tell my students that a Cadence should be based on the Harmony Rules of Bach. Bach loved following (and establishing) rules for writing music. Students will learn more about Johann Sebastian Bach in the Ultimate Music Theory Level 3 Supplemental Workbook. When writing Keyboard Style Cadences, it is important for students to picture themselves writing music during the Baroque Period. Students will learn more about the Baroque Period in the Ultimate Music Theory Prep Level Supplemental Workbook. The rules of writing music stated that Parallel Octaves (and Parallel Perfect Fifths) were not allowed. A "Parallel" interval occurs when the movement between 2 notes in the same voices in the cadence move in the same direction at a Perfect 8 or a Perfect 5. The interval between the Tenor voice (lowest note in the Treble Triad) and the Bass voice (note in the Bass Staff) should not exceed two octaves. It is actually preferable for this interval to be no greater than a Perfect 12. However, to KISS (Keep it Super Simple) - the interval between the Tenor and Bass cannot be greater than 2 octaves. The Bass and Treble Cadence directions will either be in Parallel Motion or in Contrary Motion. In Parallel Motion - the direction (ascending or descending) between the moving Treble and Bass Clef Cadence notes is in the same direction. In Parallel Motion - both will either ascend in pitch or descend in pitch. In Contrary Motion - the direction (ascending or descending) between the moving Treble and Bass Clef Cadence notes is in the opposite direction. In Contrary Motion - if the pitch in the Treble Clef is ascending, then the pitch in the Bass Clef will descend. If the pitch in the Treble Clef is descending, then the pitch in the Bass Clef will ascend. With the Exception of the Imperfect IV-V (iv-V) Cadence, the Bass notes can ascend or they can descend. Having a Contrary Motion between the Treble Cadence Notes and the Bass Cadence Notes is preferable. However, it is also acceptable to have a Parallel Motion between the Treble Cadence Notes and the Bass Cadence Notes. The Treble Cadence Notes MUST descend (get lower in pitch). The Bass Cadence Notes MUST ascend (get higher in pitch). If your Imperfect IV-V (iv-V) Cadence voices move in Parallel motion, then you will end up with that big "Harmony No-No" - Parallel Perfect Octaves! If your Imperfect IV-V (iv-V) Cadence Bass voices descend, the melodic interval would be a 7th. Try singing two intervals - a Major 2nd up and then the inversion, the minor 7th down. Which is easier to sing? Yes, that's right. The Major 2nd up is easier to sing (and play) and therefore that must be the direction of the Bass voices in the Imperfect IV-V (iv-V) Cadence. Remember that the only way that the Cadence Bass Notes can move in an Imperfect IV-V or iv-V Cadence is to ascend. The Treble Triad pitches must descend. Do you see the Contrary Motion between the staves? Do you see that each Treble Triad is in a different position/inversion? Do you see the Bass Cadence Notes stepping up a 2nd (and not leaping down a 7th!)? That's right - these are Correct! 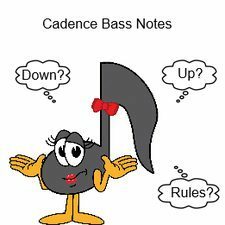 Cadence Bass Notes - CORRECT when you Follow the Rules! In Plagal IV-I (iv-i) Cadences, Perfect V-I (V-i) Cadences and Imperfect I-V (i-V) Cadences, remember that the Bass Cadence Notes can ascend or descend. While Contrary Motion is preferred, Parallel Motion is also acceptable. Treble Triads are not in the same position/inversion. The distance between the Tenor Voice and the Bass Voice is smaller than 2 octaves (and preferably no greater then a Perfect 12). The Bass Cadence Notes are ascending in the Imperfect IV-V (or iv-V) Cadence (in Contrary Motion). The Bass Cadence Notes are moving in Contrary Motion or in Parallel Motion to the Treble Triad Notes in the Plagal IV-I (iv-i) Cadences, Perfect V-I (V-i) Cadences and Imperfect I-V (i-V) Cadence. Easy! 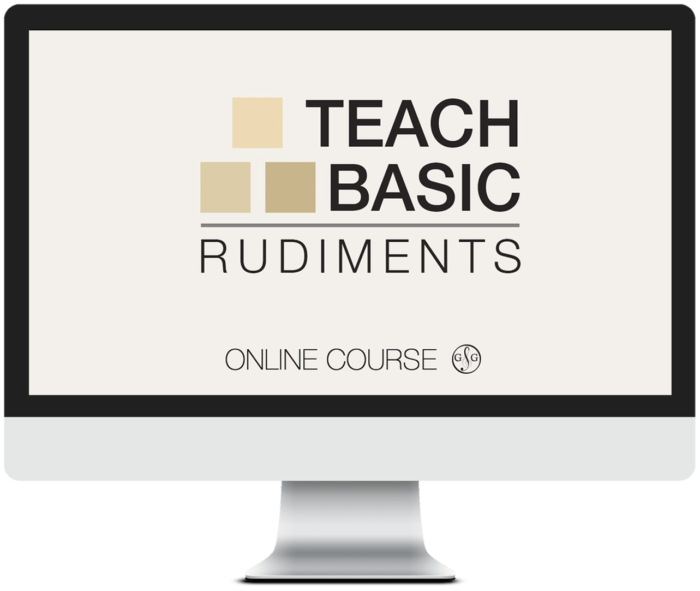 Now you are ready to teach writing Cadences using the Ultimate Music Theory Advanced Rudiments Workbook with confidence!